Is it Illegal to Modify or Destroy US Currency? On Friday, I went into work with out having eaten breakfast and I stopped by our local cafeteria at work to pick up a sausage and egg sandwich. After purchasing my sandwich and getting my change back I noticed something different about the back of the dollar bill I received. 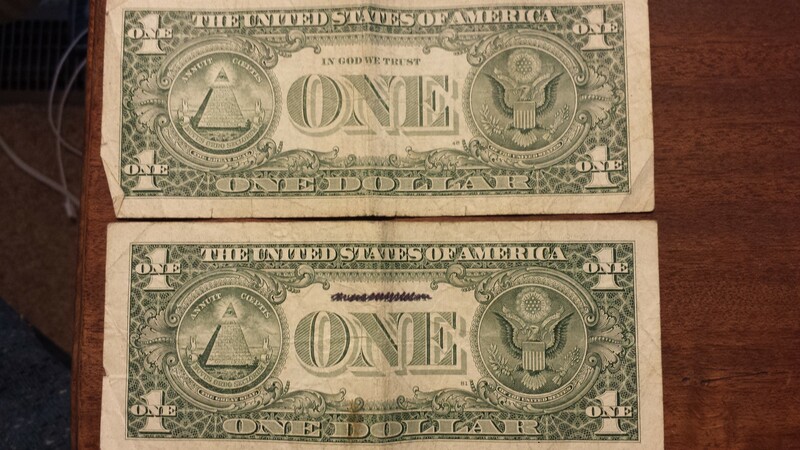 A previous owner of my dollar bill had scratched out “In God We Trust” from above the word ONE. I couldn’t believe it! So this weekend I looked for some legal facts and here is what I found. What Do I Do With Damaged Money? If it really bothers you, learn another interesting fact – the Department of the Treasury has an entire department working diligently to repair and replace mutilated or damaged currency. This little known section of the Bureau of Engraving and Printing will replace your ‘damaged or mutilated’ bills. In the event of a fire or other issue (imagine Gramps hiding money in a tin can out back and you dig it up and the money is in pieces) these great folks will do all they can to put the money back together and get you credit in NEW bills!! If that isn’t a frugal winner I don’t know what is!! They get little or no exposure and work for you! Amazing!!! Great find, Chuck! I wasn’t aware of the moneyfactory. I’ll try that out sometime! Thanks for the link! I LOVE IT!!! 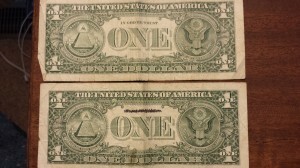 I keep every last bill I find and save it in my collection :) And others do too: http://www.moneygraffiti.com/. Hell, my business card is a dollar bill and I doodled on one for a blog post this week! Is it illegal? Possibly. Do people care? Apparently some ;) But like everything in life it’s hard to be pissed off at everything. You can do it, but you’ll be miserable unless you take action and try to reform it. At least that’s the way I look at it. This, coming from a guy who just started a blog on coins & currency: http://cointhrill.com – I’m addicted! J$ you and I are very similar that I’m addicted to collecting coins. 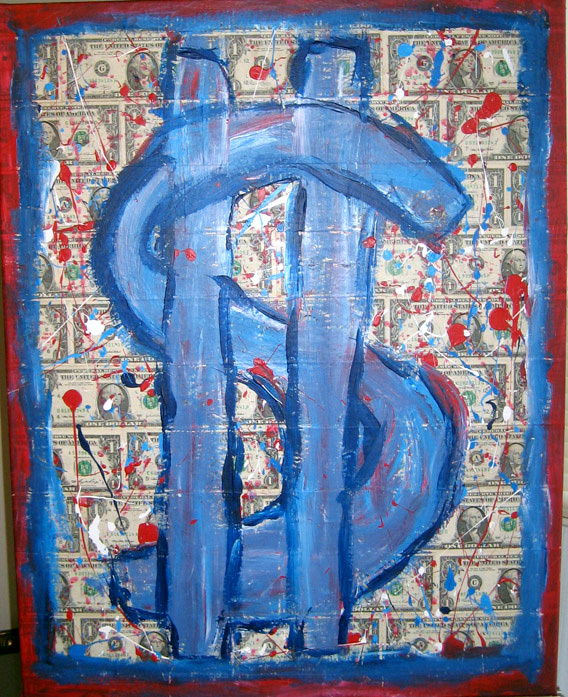 I was not aware of how into dollar art you are! That is taking defacing to a whole new extreme. :) Do you ever have any plans of trading them in? While defacing money is technically illegal, if ever challenged, it would unlikely pass 1st Amendment muster. It’s really freedom of expression and freedom of religion that we’re talking about. On a completely unrelated point, how do you feel about the “Where’s George” campaign, which tracks where dollar bills go throughout the country? That is technically defacing the currency, but virtually no one minds because it’s for entertainment. And what about kids who put coins on train tracks to see what happens … it’s all the same thing. So you have two sides of a coin here (no pun intended). You have entertaining defacement and you have defacement which is freedom of expression and freedom of religion. Andy – I love your balanced approach! I couldn’t have said it better myself. The real question is why did it upset you so much? I previously worked as a bank teller and saw thousands of US currency bills that had some type of marking/defacing/what ever on them. The money is still us legal tender. I feel that graffiti of any kind is disrespectful, whether it is on a wall, a desk, or currency. The phase “In God We Trust” wasn’t even added to the US currency until July 30, 1956. So would you be offended to use money printed prior to that? There have been many talks to remove it off of our currency and not have it printed anymore. You might see that bills printed in the future do not have the saying. I guess the frustration comes from the fact that I wouldn’t want someone defacing some of my property. Ultimately, the dollar belongs to the US Federal Reserve, and I am an American citizen. Ruth – I wouldn’t have been offended to the use of printed money prior to 1956, because no one had defaced the bill from it’s original printing. Long term, everyone knows that our country wants to push God as far away from us as possible. People don’t want him in our schools, on our dollar bills, or mentioned in the name “Christmas”, because He’s too “offensive.” I don’t doubt the “In God We Trust” will someday be completely removed from our currency. Already on the newer dollar coins the saying has already been pushed to the rim of the coins and no longer on the face. Defaced currency bothers me too, Charlie. To me, it’s a sign of disrespect of our country. Not sure there’s much to be done about it, however, unless you actually catch someone in the act.